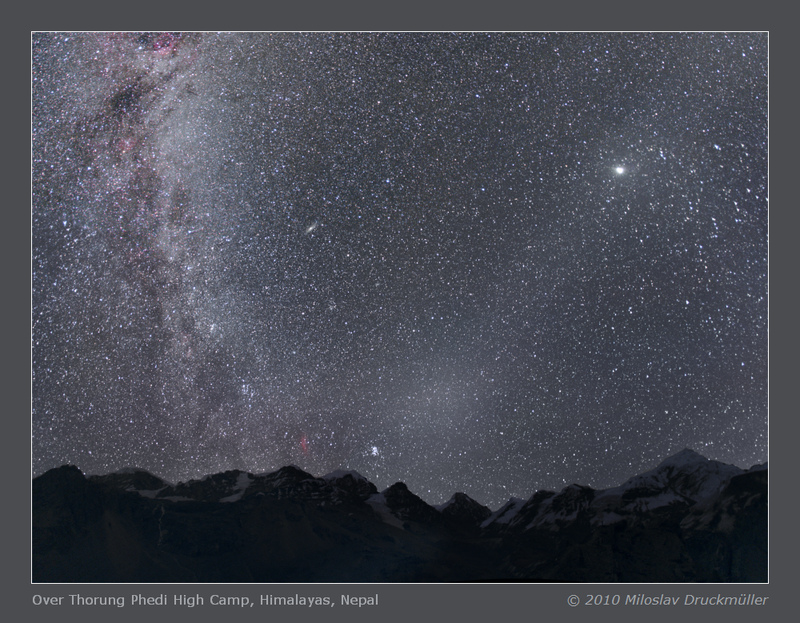 This super-wide angle image shows a view from the hill over the Thorung Phedi High Camp to the East. The bright spot above the horizon is the Gegenschein in the zodiacal light. The zodiacal light is a faint belt form gegenschein to the right-left corner of the image. The prominent red object near the horizon is California nebula (NGC 1499) and the bright star cluster to the right from California nebula are Pleiades. Andromeda galaxy (M 31) is clearly visible in the right part of the image and not far to the left and down is small foggy object - galaxy M33 in Triangulum constellation. Coordinate N 28° 46.90', E 83° 28.18', alt. 4938 m.